Matthew has graciously allowed me to show off some of my Old Hammer here on his blog. Unfortunately this means that you as the reader can expect none of the charm, and about half of the wit usually found here. 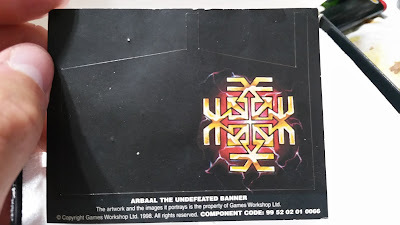 For this occasion I have dug out something from my closet that is extra special in the market of old Games-Workshop pieces. The story about how I first came to own this particular miniature begins as it always does: in a game store. 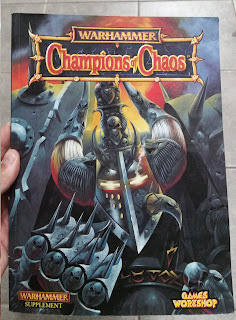 I was out of town playing in a Kings of War Tournament when the game store's dusty corners revealed an old gem to me. "Champions of Chaos" bore a piece of masking tape marked in red sharpie: $5. One of the showcased figures began to jump out at me after some trips to the porcelain throne with the old paperback. Near the back of my bookshelf is where this tome would end up after its newness had worn off. Some time later I spotted this miniature that looked so familiar on Ebay for an absurd $200 CAD. 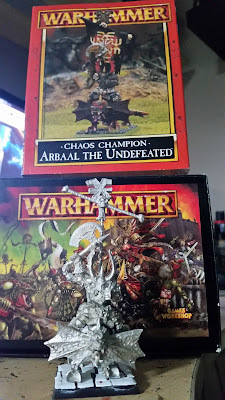 I pulled out the Champions of Chaos book to see if I could source the miniature’s back-story, points cost and so forth! Arbaal comes in weighing at 570pts, and has a Weapon Skill rating of 9. 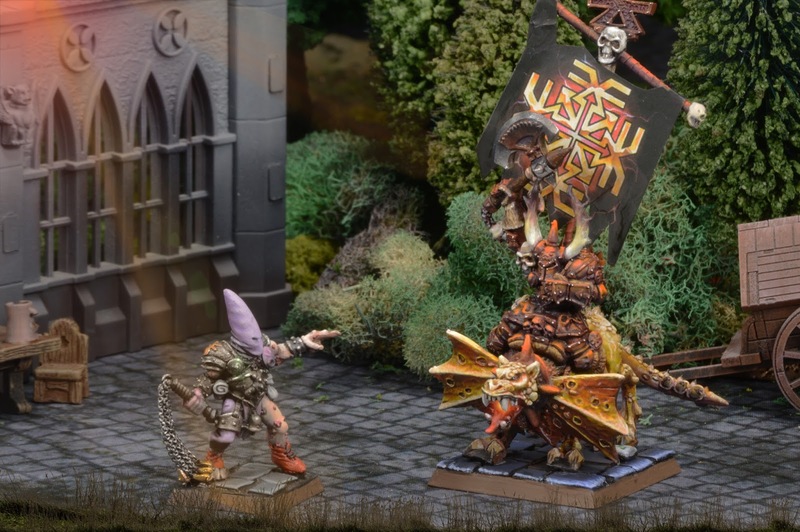 Every turn he rolls 2D6 to generate his number of melee attacks, and turns into a Chaos Spawn when he fails Leadership tests! No more than two weeks after the Ebay spotting I found a listing for him on the local Kijiji for a measly $20 CAD! I couldn’t believe my eyes. Money was exchanged and now I can bring you the above photo of his bare metal beauty. It turns out that his banner is actually a sticker à la the 90’s. I was both intrigued and dismayed to realize that this wasn’t the type of transfer that I’ve grown accustomed to over many years of purchasing GW kits. The figure went together beautifully using Super T Hot Stuff, no pinning required. I couldn’t help but notice how cool the box he came in was while I was putting him together. I’ve just finished painting some modern GW plastics and 5 crisp Infinity sculpts. I’m not sure why exactly but it felt as if this old model was fighting against every inch of the paint job. I struggled with the rounded edges and blown out details on the rider. Not being a huge fan of the paintjob exhibited on the box art I decided to attempt a decidedly more red & bronze scheme. There are things about the final paint job that I like, and some that leave me a little disappointed. The things that I like include the horns, the axe’s blade and the glove’s fur. What surprised me was how good the sticker-banner looks when compared with regular hard plastic banners. 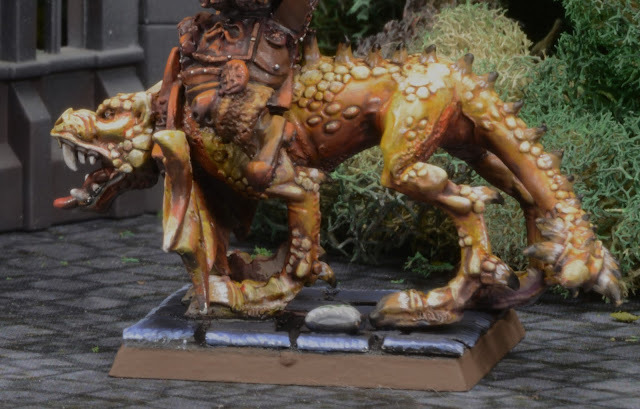 The pooch upon which Arbaal rides went through multiple colour changes, and ended up being one of the things about the paint job which left me disappointed. Perhaps it is the way the horns don’t contrast with the skin, or the general messiness of the skin details. A Slaanesh Champion challenges Khorne’s most devoted servant to a throw-down. Nice work Travis, you certainly do know your way around a paint brush. 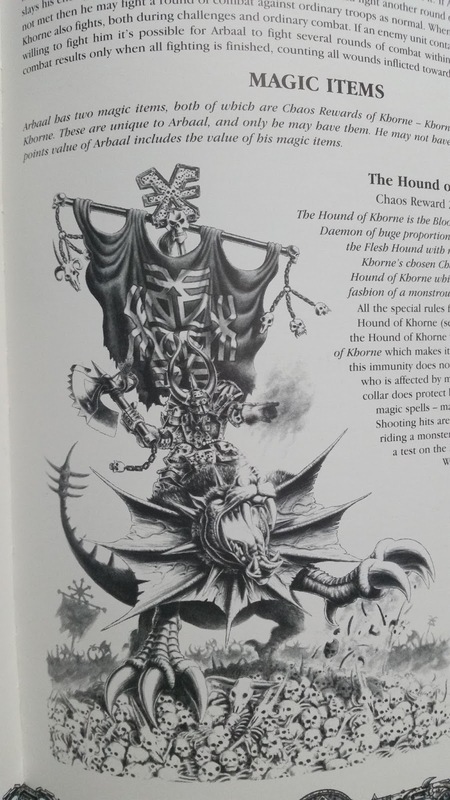 Really like the colour choices on the hound, far more interesting than the colours used at the time for these beasties, red&green. Hope to see some more guest posts here! Hey thanks for saying so. I agree about the original paint job. It's cool to see how the 'Eavy Metal team has progressed over the decades. I like this whole guest post thing! I will have to beat the bushes for some more ringers for the team. Well, nice guest post! I do love how this guy and his beast look! The colour choice is certainly a total win. Cool job! Good stuff! 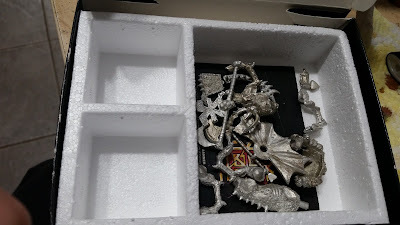 The bit about the box made me smile, as I thought I was the only one who saved the boxes (I still have an RTB01, trying to figure out how to frame it properly). 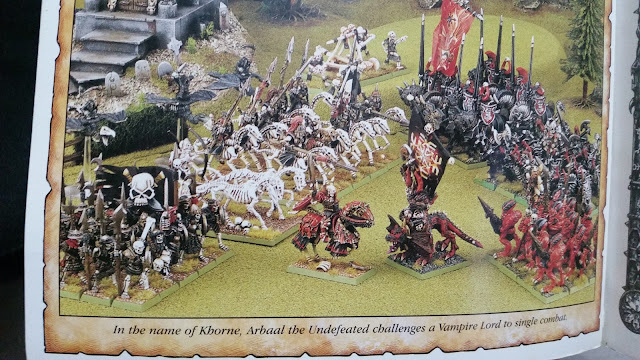 Fun fact though- this is actually the second studio painted Arbaal- I believe the first was done by Neil Hodgson for the original Warhammer Armies Chaos and had a green frill on the Flesh Hound? Haha sounds like a sharp memory and some super insider information. I would be interested in seeing that first studio paint job! Nice work on a very cool old model! Very nice work. I love this model. I think it looks great! I like that you didn't just do the whole thing red. An excellent internet find to be sure. Nice stopover! Great job. I remember Arbaal was a nightmare in my rookie season.